Compost is great for soil structure and offers digestible nutrients for plants. Cold compost typically has more worms in it as they are the primary digesters in cooler weather. 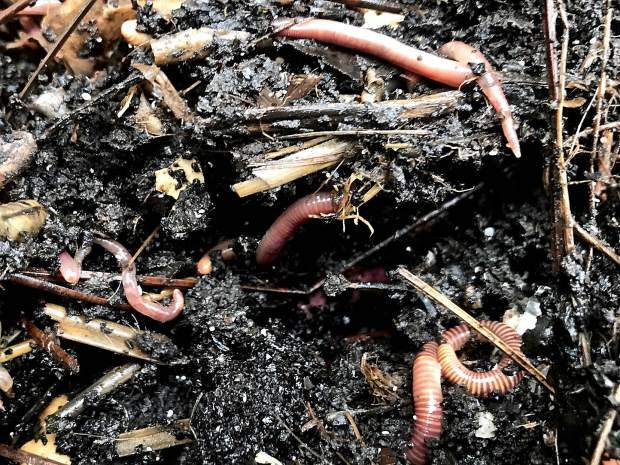 Do you have compost envy? Do you covet your neighbor’s compost and wish yours was as dark and rich? Or have you never even considered making the stuff? I’m here to tell you it’s not that complicated and it’s worth doing. Compost contains the magical cast of characters that live under our feet and keep the world humming by feeding plants. Organic matter, custom-made to improve your soil, is anything currently or formerly alive. This can include Fluffy, your kid’s hamster that’s buried out under the rosebush or — more often — stuff like leaves, lawn clippings and worm castings. Compost is, of course, good for soil structure, and offers plants readily digestible nutrients. The real “gold” in this black gold, however, is the life it puts in your soil. That life is what makes good soil good. So how do you make compost? It’s really pretty simple. There is “hot compost” and “cold compost;” don’t be confused by this. Both are valuable for building soil. The theory behind getting your compost hot is that it kills diseases and weed seeds. This is certainly true, but I personally don’t worry about diseases or weed seeds, because of how I garden. The best defense against diseases is biodiversity, which ensures there are enough enemies of that particular disease to eat it or compete with it for food. My approach to disease control is to add, not subtract, microbes. A good mix keeps the neighborhood from going bad. Nor do weed seeds frighten me. I keep a thick mulch on all my growing beds, all the time. This shades out weed seeds, feeds the soil food web, and makes it easy to pull up any weeds that sprout in the soft mulch. They then get thrown down as more mulch. I think of weed seedlings as alfalfa sprouts for my soil food web. Hot compost tends to be more bacterially-dominated, which makes greener, shorter-lived plants happy. Cold compost tends to be fungally-dominated; perennials and shrubs prefer that. (This isn’t on the test — I’ll talk more about it in a future column). And cold compost has more worms, which are the primary digesters in cooler temperatures. The organisms in compost make it self-correcting; they adapt to the plants they’re working with. A space. Maybe 4 foot square. A hose with a trigger-type shutoff nozzle. A pitchfork or spading fork (also my favorite digging tool). Plant matter, both “greens” (fresh) and “browns” (dry). Greens: vegetable peelings, apple cores and the like from your kitchen; grass clippings; anything cut or pulled from your garden that hasn’t dried up yet. Browns: dry organic matter like leaves, pine needles, hay, straw. Keep a small, dry pile of “browns” next to your compost to layer on top of the” greens.” A bale of straw works nicely for this. Start whenever you’re ready. Throw that little bucket of broccoli stems and carrot peels down; throw some dried leaves on top, or rake some duff from around the pile, ending with a brown layer to shade the worms and germs underneath. If the weather is dry, sprinkle the browns to keep the pile moist. You don’t need any minimum amount of material — just start layering what you have. Toss on weeds you pull and prunings, chopped into about 4 inch pieces. When you prune or pull up spent garden plants, or do serious weeding, chop that stuff onto the pile with your clippers or a machete, then throw on some browns and sprinkle if needed. The goal is to have about three times as much brown waste as green but, as in most of life, this doesn’t need to be exact. Every week or two go out with your pitchfork and hose and turn the pile onto an adjacent space, or just lift and “toss” it up in the air; the idea is to mix and aerate it. As you do this, notice how wet or dry it is — the goal is for it to feel like a wrung-out washcloth. Correct moisture by either sprinkling as you turn or by adding browns. Compost is “done” when you can’t tell what it’s made of. It will look like rich, crumbly dirt which is, in fact, what it is. Take a little bucketful with you when you’re planting and chop some into the hole; your plants will love you for it.